Halloween is approaching, and as a Christian I'm faced with a few issues. One is I know that for many people, witches and ghosts aren't cute decorations to put up in your yard. There are real, satanic roots there, and demons from a dark past (or present) do haunt many that night. I grew up knowing there really are witches and there really is much evil that goes on in the world and especially on that night. (I still love Harry Potter...but that's a different blog...) I'm grateful for that exposure and that I wasn't given a pat "Halloween is bad" excuse, and we still managed to have a "Harvest Celebration" and not feel like sticks-in-the-mud. But that is not the issue I want to focus on today. A year ago I read an article about child slave labor in the cocoa industry. And once you learn something, you can't unlearn it. Granted, I love me some M&M's. Favorite candy, hands down. But every time I've bitten into that wonderful crunch I've had this nagging voice in the back of my head, and I know for a fact my consumption of Hershey's or Nestle products has decreased in the past year because of that awareness. This is the first year in our own home, and the first Halloween we are even able to hand out candy to trick-or-treaters. And as I pass the shelves and shelves of jumbo bags of bite-sized chocolates I just can't bring myself to buy one. When I hear the word "abolitionist" I think of 19th century parchments and hoop skirts and other things long out of style. I think of great men and women like William Wilberforce and Harriet Tubman. But then I consider the fact that according to the International Labour Organization (ILO) there are between 20-30 million slaves currently in the world. More than at any other time in history. Not only that but the value of a slave has increased drastically. In 1809 a slave was worth about $40,000 in today's currency. The average today is $90. You can see more stats here. Cocoa isn't the largest group by far, and there are slaves closer to the door of your home than you may imagine. Two West African countries, Ghana and the Ivory Coast, supply 75% of the world’s cocoa market. A report from the International Institute of Tropical Agriculture finds that there were 284,000 children working on such farms, often in dangerous conditions, often in some form of indentured servitude. Some children are “sold” by their own relatives to traffickers or to the farm owners. Traffickers often abduct young boys from small villages in neighboring African countries, such as Burkina Faso and Mali. Most of the children are between the ages of 12-16, but children as young as 7 have been filmed working on the farms. 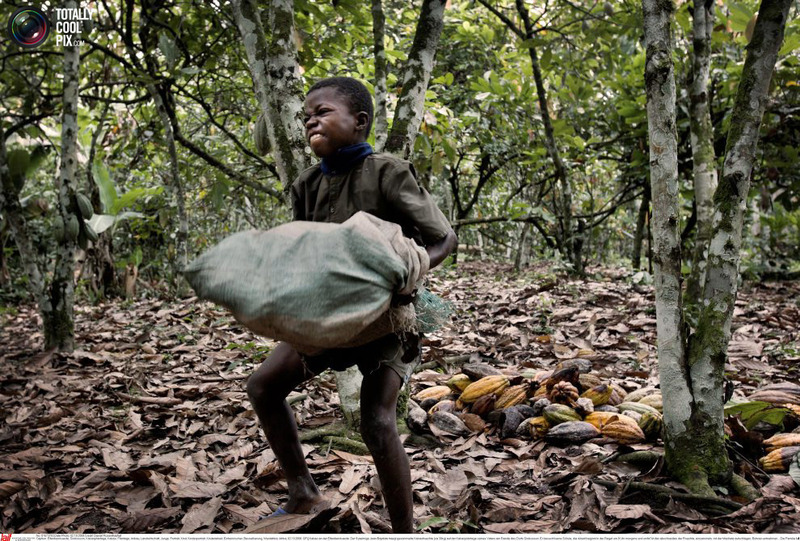 In recent years, cases have been documented in which children and adults on cocoa farms were retained against their will and forced to work. Cases often involve acts of physical violence, such as being whipped for working slowly or trying to escape. The point of this post isn't to make you feel guilty. It is to make you aware. Having recently watched the movie Amazing Grace it stood out to me that most of the people who helped bring the brute force behind the movement were common people. People who listened to someone or read something and gave up sugar and signed a partition...and that was mostly it. Most were not the spearhead of the drive for abolition, they did their minor parts and collectively helped drive the initiative. Both Nestle and Hershey have tried to downplay the percentage of cocoa that is obtained through child labor, saying most cocoa is from small family farms (doesn't that paint a cozy image?). And both have now signed they will exclusively use Fair Trade certified cocoa by 2020. Hmm, good thing it's such a small problem it will only take eight years to fix. I'm not hereby vowing to never eat another bite of Godiva again or put out any ultimatum like that. I know I won't be able to adhere to that. But I am trying to make a more conscious decision about what and how much chocolate we consume. I'd love to take a bite of frozen yogurt and crunch into those frozen M&M's without that nagging voice in the back of my head. So back to the cute four-year-old Captain America at your door saying "trick or treat!" What do you do? There's a few alternatives. There's Fair Trade certified chocolate, organic chocolate which--according to an article on UCSD's website--is OK because organic farms are subject to independent monitoring, and there are alternative to chocolate altogether. You can do something like Annie's Organic Gummies, bags of chips or HERE is a great list of more alternatives. Tatum is still going to be an adorable little bumble bee this year as we hand out candy because locking your doors and pulling the shades on the darkest night of the year is probably not the best way to let your light so shine so that Christ may be glorified. Greater is He who is within us than he who is in the world. But this year, maybe be a little more aware of what you are consuming, and what you might can do about it. I did made in the U.S. hard candy. Wasn't a popular choice with the kiddos, but I didn't have to feel guility. Amelia and I also only went the praise and worship concert at HHBC. I got away with it this year, but we will have to see about next year!